As always to create a meaningful model for follow up, you need comparison since figures alone mostly are without meaning giving you no clue on what is good or what is bad. Discussing these topics with people working with new product introduction has given me this understanding. Sometimes nothing happens for a period of time we just have the product for delivery. After a while or sometimes before we get the product we plan for a campaign, where we put in marketing efforts to push it. This often leads to a period with a rather steep selling curve. Then after a while everything stabilizes, we change focus and some customers liked the idea and keeps on buying and new arrives. We go into the “normal” accelerant phase which could go on for a year or two with the marketing effort we believe the idea is worth, else it will be a drop out with some loss of confidence with some customers. Trying to make all these words meaning for a computer could be something like the curve to the left. ph1 is the initial testing, which should be ignored for monitoring. ph2 is the intense marketing effort giving a significant start of sales. ph3 where marketing effort declines and the product goes into it’s own growth phase with “normal marketing focus”. ph4 is where the product has gone into it’s mature phase, where loss of sales still is compensated of new customers arriving. The four lines giving a good approximation of the start of the bell curve. 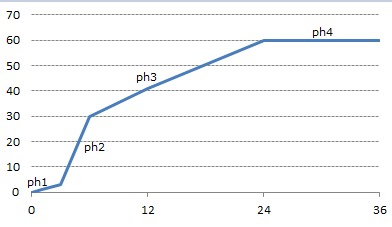 It could be represented by a model described by three lines representing the part interesting for follow up (skipping ph1 which also makes ph2 start at 0). When planning for a new product most organizations try to make estimates on volume and margin based on earlier experience or on market research ending up in tables as below. 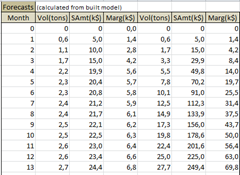 Problem one, these tables are always too optimistic for the first year, but that is another story. Most often are the decision to give the new product a try based on these estimates. 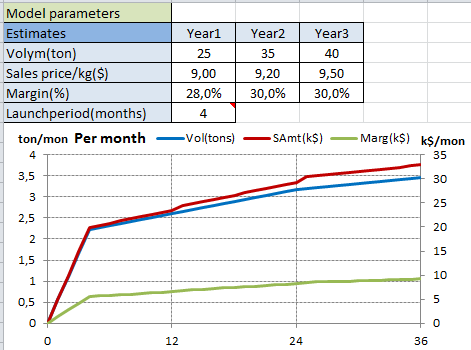 Could then these figures be combined with the curve to create a model for forecasting the interesting parameters: volume, sales amount and margin. 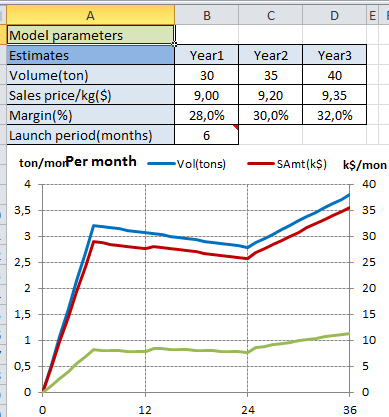 If so we have the comparison values we were looking for, to create a acceptable model for follow up. The only parameter needed is an estimate for the length in months of ph2, the intense marketing period. 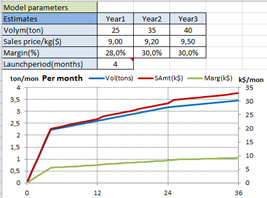 With this in place a simple forecasting model for monthly values of all then KPI:s could easily be built. 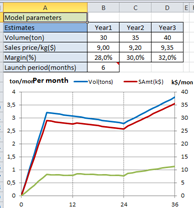 The model gives you forecast values for KPI:s of interest. 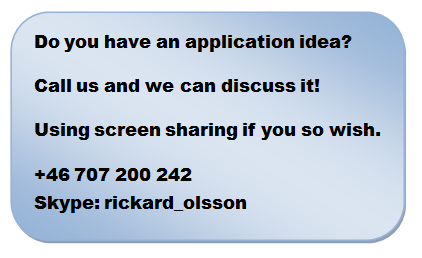 If you would like to test the model, click this link. 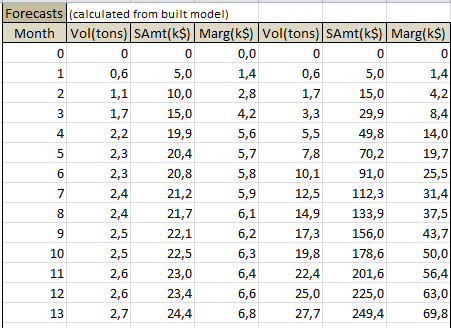 The model is fast to give you a hint when you overestimate first year volume. People tell you that the initial marketing phase will long for six month and you need more volume the first year so you put it up to 30. The model react and give you declining growth after that. This could be a correct opinion about what you expect, but if not you have to modify so the curve gives what you expect. This trivial model gives you a hint for what is mathematically possible. As all mathematical models it is always an approximation, to make it useful the deviations should be acceptable.